The Speks set of magnetic balls is a satisfying fidget toy for your office or home. It features 512 earth magnets that allow you to build different shapes and constructions. You might have seen these earlier when they were named Buckyballs or Zen Magnets. It’s a delight to see these tiny magnets dance around your table or desk when putting them together. Be warned though, next to being very tiny they’re also addictive and once you pick them up it’s hard to put these down again. 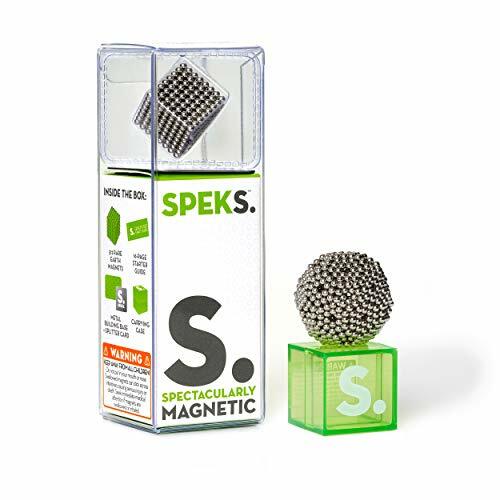 Next to the original silver color you can get the Speks magnets in different color versions. SPEKS BUILDING MAGNETS: 512 rare earth magnets. Smaller in size but endless possibilities await. CREATE: Build and engineer limitless shapes and structures. STRESS RELIEF: From the board room to the dorm room, mash and smash stress away. AGES 14+ Keep away from all children. Magnet flux index less than 30.